Washington, D.C. – October 11, 2012 – The design and construction industry, still reeling from the real estate crash, could face another $2 billion in lost work if Congress and the White House fail to reach agreement on a federal budget in time to avoid massive mandatory federal spending cuts on January 2, an American Institute of Architects (AIA) analysis released today warns. Read the full report here. 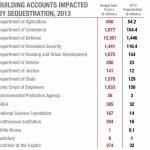 Using a report issued last month by the Office of Management and Budget (OMB), the AIA analysis identifies 48 separate budget accounts targeted for spending cuts that directly fund the design, construction and rehabilitation of buildings and other vertical infrastructure, including the iconic Capitol dome that is the symbol of American democracy throughout the world. “At a time when both political parties are campaigning on being the best at creating jobs, both are risking the jobs of millions of Americans by placing ideology above governing,” said AIA President Jeff Potter, FAIA. “The design and construction industry is a significant portion of the national economy, and we urge both sides to put aside their political differences and come up with a budget that keeps people working, especially if they are working on a national infrastructure befitting of the 21st century,” Potter said. 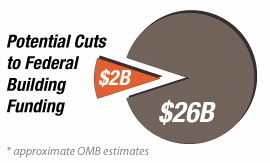 The Budget Control Act of 2011 requires some $1.2 trillion in spending cuts absent an agreement by Congress and the White House to reduce the federal deficit by other means. 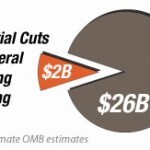 As of August 2012, numerous agencies across all three branches of government accounted for a seasonally adjusted annual rate of federal construction put in place of $25.2 billion, according to the U.S. Census Bureau. 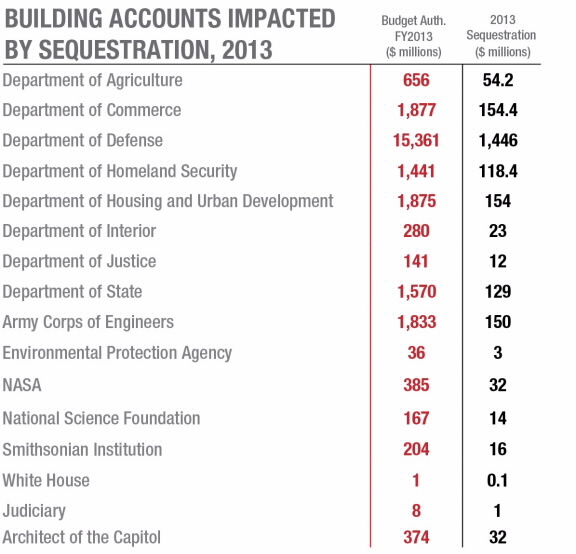 In July, a study by the George Mason University Center for Regional Analysis found that the total employment impact of budget cuts on federal personnel in architecture and engineering occupations at 61,483. However, this number does not include the job losses incurred by government contractors or construction workers, which could possibly boost that number significantly higher. The AIA analysis uses a 2007 Center for Regional Analysis study to further pin point job losses in the sector. According to that study, every $1 billion spent on design and construction yields 28,500 full-time jobs. Under that formula, as many as 66,500 full-time positions could be lost in a sector that accounts for roughly 11 percent of the nation’s economy. About The American Institute of Architects: For over 150 years, members of the American Institute of Architects have worked with each other and their communities to create more valuable, healthy, secure, and sustainable buildings and cityscapes. Members adhere to a code of ethics and professional conduct to ensure the highest standards in professional practice. Embracing their responsibility to serve society, AIA members engage civic and government leaders and the public in helping find needed solutions to pressing issues facing our communities, institutions, nation and world. Visit www.aia.org.